After a brief introduction to this mystery lets us continue with the analysis of brother Soulaiman Soussi. First we will look at the existing theories of the origins of the Yamal crater. We will consider why they are ludicrous or insufficient and which features of the crater are not adequately explained by these existing theories. Then we will propose Soulaiman Soussi’s theory as an alternative that better explains the geological features of this crater and its historical context. We will see how this interpretation is best supported by the photographic and historical evidence. Since we began this series news of a second hole emerged. It’s photographs support this theory and we will examine it shortly. We do not claim this to be the only possible interpretation. We merely suggest it as the most likely, and that others are easily debunked or can be exposed as being politically motivated or the result of open deception. Given brother Soulaiman Soussi’s research, including past research into Soviet Siberian history long before the crater was found, we feel that what we’re about to reveal to you is the most likely scenario – and the one that most fits with the geostrategic concerns of present-day Russia and its junta is led by President Putin. Current theories, from the silly to the implausible. Clearly much has been in the media lately about this anomaly. Siberia’s Zvezda TV’s airing grainy helicopter footage of the crater made the issue spread memetically viral. A subsequent helicopter video, take by a team of scientists visiting the site further piqued public interest and contributed to a flurry of speculations. These are the more significant speculations. Claim: Space aliens or UFOs. There is absolutely no evidence whatsoever of an extraterrestrial cause, whether by force of nature such as meteorites or an asteroid, much less than intelligent alien life. These sort of claims are simply wild guesses or worse purposefully planted disinformation and confusion. Even considering it makes one feel an IQ drop of several points. It is a distraction meant for certainly easily impressionable people. For others there are more sophisticated lies. Claim: A Collapsed Pingo. 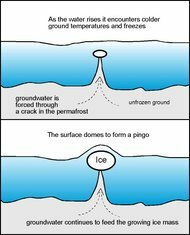 A pingo is a type of conical hill found in tundra permafrost areas in Eurasia and the Americans. Pingos occur in permafrost when excess water, from a draining lake for example, is forced into previously unfrozen ground, and the ground deforms to relieve the growing water pressure. Over hundreds of years the ground projects upwards on-top of this growing bed of freezing water being absorbed in that area of the ground, often cracking near the summit of the hill as it grows and partially collapsing in on itself. Notice these features, the relative height of the hill’s ridges, the distinctive smooth contours upon collapse, and the closeness of piled material to the crater. In no case is there the appearance of actual ejecta, material violently expelled. If you search for pictures of Siberian pingos you will note this pattern repeat over and over, whatever this hole in Yamal is, it does not resemble a pingo collapse. Their contours are smooths, there is no sign of rapid expulsion of ejecta, no signs of a violent explosion and dispersal of material. Put simply this theory is an idiotic grasping at straws. Claim: A naturally occurring gas explosion, climate change induced. Sub-Arctic Scientific Research Center researcher Anna Kurchatova, first put in the claim that a pocket of natural gas when combined with salt and water could have produced a large explosion. The ultimate cause of this would be permafrost thawing due to anthropogenic climate-change. This claim was made, of course, at a distance without the researcher having visited the site. The exact chemical mechanisms through which this could occur were not stated. We could not find any clear evidence such a naturally occurring gas explosion, in Siberian tundra, with warming permafrost, due to a mix of salt and water, has ever been documented. Anna Kurchatova’s claim is simply a theoretical speculation, her opinion, made in absence of any valid research data. Because of current concerns over global warming clearly this opinion resonates in the media, and this may be the point of it. At best it is a scientist’s semi-informed speculation, made at a distance, when given a voice in the media, at worse it represents a politicization of the science of the issue. It is a wild guess and only her position and authority gives it the illusion and veneer of authority. Claim: Unspecified Natural Causes. Possibly Climate Change linked. Anna Liesowska, at the The Siberian Times (17 July 2014, ‘First pictures from inside the ‘crater at the end of the world’) interviewed Andrey Plekhanov’s research team after their expedition to the Yamal crater. Plekhanov claims the crater is a natural phenomenon without human cause. While his team doesn’t know when the hole formed, he states “We are working with space photographs to figure out exact time of its formation.” Plekhanov further says. “We can be certain in saying that the crater appeared relatively recently, perhaps a year or two ago; so it is a recent formation, we are not talking about dozen years ago.” How he can be certain regarding this is not stated, of course, and The Siberian Times takes it on his authority. Unlike Anna Kurchatova Andrey Plekhanov actually was at the crater, examined it physically, and conducted tests there. You will note his wording is more cautious than Kurchatova’s. However this phrase, “and then say it more definitively” rhetorically more or less presupposes that global warming would ultimately be dredged out as a causal factor – post further research. For now, however, “we can say for sure that under the influence of internal processes there was an ejection in the permafrost” without reference to climate change or other human causes. How exactly Plekhanov’s team could say “for sure” is not stated. In case we aren’t yet clear he further asserts; “I want to stress that it was not an explosion, but an ejection, so there was no heat released as it happened”. This statement addresses previous researchers’ observations, that the blackened appearance of the crater’s sides certainly were burn marks. Plekhanov claimed the natural processes involved were covered in a theory Soviet scientists worked on in the 1980s. This unspecified theory was one that was “left and then forgotten for a number of years” as he put it. As to the terms of the theory, who actually proposed it, and its literature, none of this was stated. This makes his unspecified “theory” effectively a ‘black hole.’ it is effectively a convenient rhetorical dodge. He further claimed this theory addresses natural processes in the permafrost that led to prehistoric formation of a number of lakes in the Yamal peninsula roughly 8,000 years ago. He then speculated that perhaps these processes are repeating today. In short, he has no idea. Since he is effectively a government scientist (if he is, in fact, a scientist and not an intelligence operative) you could assume that he is simply repeating whatever those apparatchiks who sent him there told him to say. In other words, his statements are effectively a stalling for time. His claims boil down to this; whatever caused the crater were “natural processes” and somehow vaguely connected to a 30ish year old Soviet theory that somehow was just “forgotten” by their research community. Claim: A natural gas explosion, human induced. The nearest gas fields are 30 miles away, there are no known gas pipelines through the permafrost in this area. Moreover as researcher Andrey Plekhanov, from above, notes “If it was a man-made disaster linked by gas pumping, it would have happened closer to the gas fields” and “Gas workers would have been on alert, letting us know about it immediately.” This claim can be dismissed out-of-hand. Be serious. Please. This is not science fiction nor is it Hajji Baba telling you bedtime stories. This is only slightly more ludicrous than UFOs and Space Aliens. The only reason we included this easily blown down straw-man is to illustrate how confused people are truly being. The notion is idiotic. Now let’s consider more plausible matters. Our next part will follow. Peace be upon those who seek it. 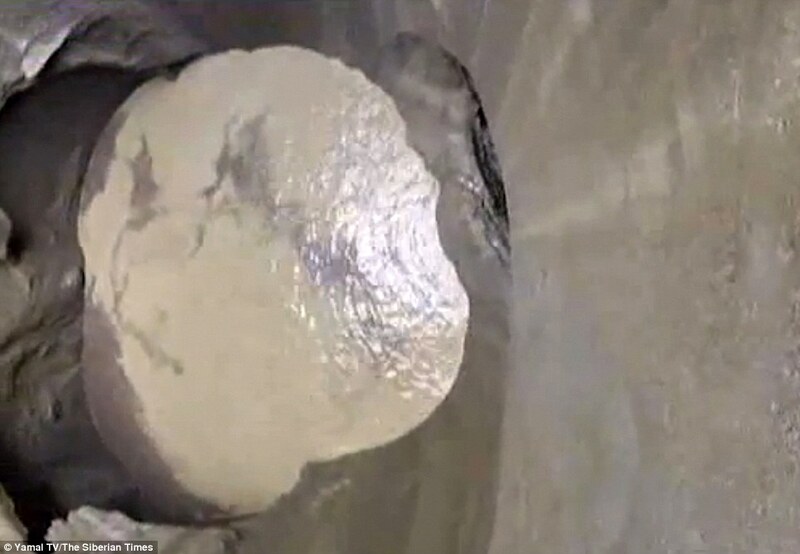 The world is currently abuzz with the discovery of a mysterious crater, found in siberia. The giant hole was discovered on a peninsula in siberia’s natural gas rich yamal region, a word meaning ‘end of the earth’ in the siberian nenets dialect, and is believed by many to be the result of an underground explosion. Speculations about the crater abound, and range from the barely plausible to the outright insane. Sundry causes have been claimed, like meteorites, UFO activity, gas industry triggered underground explosions, and even more natural geological processes perhaps being accelerated by anthropogenic climate change/global warming. There exists one possible explanation, however, that has been studiously ignored by both the mainstream and alternative media. This possible cause may yet be the most plausible explanation of all. This likely solutions to the mystery of the siberian giant hole may fascinate and amaze you. We at Cipherverse caught up with the researcher Soulaiman Soussi (Abu Abdullah) to get his take on the controversy. As it turned out he had been busily researching the crater’s story and the history of the region. We believe that his research results and the hypothesis he presents may shock you. It certainly shocked us. However in hindsight you may find yourself slapping your forehead due to the elegant simplicity of his hypothesis. We are confident that if you are open minded and thoughtful, you too will see this explanation as the only truly plausible one. Before we can present it, let us work our way through what is known and examine a few facts. To begin, let’s take a look at what we have all been told about the crater, and the bare framework of the story as it is known. The yamal peninsula, in the yamalo-nenets autonomous region, is one of the most remote areas of the world, as the name ‘yamal‘ itself implies, for it means ‘end of the earth‘ or ‘end of the land‘ in the dialect of the local nenets people. This remote peninsula arguably sits on top of the largest source of natural gas in the entire world. Its very small population consists of its indigenous inhabitants, and a small handful of gas industry workers. Other than this the yamal peninsula rarely sees much human activity. Its most famous inhabitant is a long dead, 30,000 year old, baby woolly mammoth calf dug up from the permafrost. The crater itself is in a remote part of the peninsula itself. It is located approximately 30 km from the peninsula’s gas fields. The crater itself appears to be 50 to 70 metres deep, and about 30 meters across according to the most recent accounts. Its walls seem comprised of strata of permafrost and possibly stone, though the first few feet appears to be a thin layer of brown top-soil. Beneath this the permafrost appears blackened, and riven with striations indicating considerable water erosion. In spite of these erosion caused rivulets the actual walls of the chamber appear very sharply cut. The entrance to the hole is roughly oval shaped, and a larger chamber can be seen below in some photos, which gives you the impression of a narrower entrance leading to a larger interior cavern. At the very bottom appears to be an icy lake comprised of melt-off from the permafrost. When you look at its photos you will notice a ring of debris surrounding it. Marya Zulinova / Governor of Yamal-Nenets Region’s Press Service. Linked from the Moscow Times. These debris appear to have been ejected or expelled upward and then quickly settling around the actual lip of the hole. You will notice the debris ring is fairly close to the crater, very little is apparent a further distance away. Notice also that there’s very little plant growth on the immediate lip of the hole. In fact, several portions of the debris ring are absolutely bare of any plant life, whilst other portions have mixed grass or low scrub growing upon it. In other words the plant growth is spotty and for the most part there is very little of it. This describes roughly what is it. However the question presents itself; what does it mean? Now that we have seen some pictures and facts in part 2 we shall take a deeper look at this mystery, and then propose abu abdullah’s explanation, one far more likely than what the propagandists are feeding you. Peace upon those who seek it. One; All information in the Universe is from Allah, thus all wisdom is from Allah. Two; Thus information in this Universe can only be transferred, it is neither created nor destroyed inside of this closed system of a Universe. Three; Any influx of New Information into humanity, and its subsequent manifestations, are from Allah. The nuzul of Revelation is a quantitative and Qualitative addition to the informational content of the universe itself. Four; the Hadiths of the Dajjal Island and Ibn Sayyad must be understood if one is to have hope of understanding any of these matters. The knowing of the first two seems easy but the actual understanding of them and their implications is difficult. The third derives from the understanding of the first two, and our authority for the fourth statement is Ali Ibn Abi Talib, Allah ennoble his visage, in his narrated statement that the one who knows Ibn Sayyad is the Dajjal will be happy, and the one who does not will not be happy. Here we begin to look at Logic, and in what follows will return to logic. In any logical operation you can perform valid operations upon invalid data. If you start with the wrong axioms but use correct reasoning you will arrive at questionable conclusions. Now if you take wrong axioms, an then start to use wrong reasoning going step to step all the way, then you will simply arrive at stupid, bizarre, and throughly delusional conclusions. Here you will never be able to actually solve the problem at hand, but will simply knit for yourself a tangled web of delusion. Think to yourself, is it not truly quite as it seems? Does it not seem like the very opposite? Civilization, Society, Instinct and Logic – Part 1, Memetics, Turds, and Education Share? We examine Civilization, Culture, Environmental Degradation, Squared ashlars, and Memetic Programming, asking ourselves the differences between Civilizations of Kufr and Iman. We contemplate ways in which natural instinct, the notion of Fitrah, and developed social complexity fit together. Disclaimer: When we use the terms Mumin (believer) and Kafir (mistranslated as infidel, actually hwever a rejector covering up truth, or ingrate) we use them in the most universally applicable sense throughout tens of thousands of years of human history, in discussing fundamental human dynamics independent of the formal name of the community in question. This article must be understood in the widest sense possible, as it covers the entire scope of planetary human history. Part of Iman is accepting the things that we cannot change in ourselves and around us. Not accepting is essentially not submitting to Allah’s decree. The nations of the Kufar are afflicted with a psychological disorder, born of the tragedy that someone sold them a false bill of goods; comprising of a false reality. When people buying this false bill finally come into contact with real reality, reality as it is in the world and not as it seems, then they don’t want it. This is of course by degrees, some find it easier to accept some aspects of reality than other, but essentially within a range of possible reactions they tend towards Rejecting the Real. Ding Dong ! The Dong Feng is here ! The tragedy of our American Country, some have observed, is that we often appear to be a country of misdirected sheep. Millions fear the so-called Taliban, and mythological shoe bombing terrorists who live in caves; however a far greater, and far more real, menace has been quietly gathering ground. A few may object, at the “elite” level of the “owners of capital” and the means of production, on the level of corporate and financial elites (and our analysis of so-called elites will soon be posted) there is interlocking of interests and power. The matter is far more simple, and yet at the same time more complex than people make it out to be. Yes, there does appear the illusion of interlocking power interests among so-called “ruling classes” or “governing classes” or certain narrow “elite classes” elements, in the West and China. But these so called classes, are more coteries or cliques – often small and insular functionaries of other entities than would first appear, say 10 or 15 neo-con policy wonks, or something like that. And sure, certainly on a high corporate executive level, and higher still, the level of global finance interests, but ultimately these people really don’t fully know what’s going on anyway, either.. It would be most unwise if you let this distract your eyes from other levels of reality. We assure you, the Chinese government and military absolutely pose a mortal and existential threat to people of the USA, and the Western World in General, and they pose an immense threat to the peoples of the middle east, and the rest of Asia in general. The Koreans, Japanese, and Indonesians in general, should feel fear now. Once the US military and government and its usefulness is at an end. Few know the degree to which the American empire had a specific historical purpose and role, once this is done there will be successors to the American State, on the world’s stage, and China fully intends to be that successor. Those who believe that the American empire is bloodthirsty have not seen anything quite yet. The century of China yet remains. Disclaimer: Again, if you are listening to or reading this, any of the group descriptions we make probably do not refer to you. We are not talking about races here, rather we are talking about memetics, linguistic, and cultural and religious programming. If you are offended by any of this, then you are not fully considering the issues at hand. Synopsis China talk, part 4: Recap, our warning to our Japanese and Taiwanese friends. Ancestor worship inevitably leading to racism. Consider if one sees you as a bug almost a different species, do you think you really matter beyond their mountain range? Example of Ghengis Khan’s horde, from behind their wall, saw no similarity to other people, no poems about their enemies, just extermination. Differing between mentalities, Crusades and European wars and then contact over the years, Templars similarity, adopting language and food of the Muslims, Europeans seeing similarities with Muslims after the initial onslaught – versus utter extermination by people who see themselves as almost a different species. Templars who became Muslims, the early forms of crypto-Islam in Rosicrucian, Freemasons, etc., the Church’s purge on Templars, Friday 13th, why Friday? Secret suppression of all Templar lodges on Friday and their eradication, baphomet and the satanic PR campaign to bury the true history of the Templars, the secret of the Ram symbolism, Newton’s pure monotheism the same as Muslims, all of this points to affinity between European and Islamic mind. No such affinity felt with the main-land Chinese, you are not part of the group. What about Chinese who settled in the west, they are not part of the Herd and are immune to what we are talking about, culturally western Chinese immigrants have different memetic frame sets, younger Chinese growing up in the West speak a different language, and learning a new language alters your memetics. Important diagnostic factor is language barrier. In fact, young Chinese in the West could explain the thought differences better than we could. Mao Tze Tsung, 21st century dictatorship, out of 1.4 billion people, where are the proportional protests against dictatorship? Herd mindset. Synchronized marches, perfect synchronization, herds of marchers. Many other anecdotal phenomenon, add it up and you realize someone has herded this people into a synchronized army, the largest synchronized killing machine in history, and the individuals caught up in it do not realize they have a choice not to obey the mental and operational military order. E.g. Memetic organization of the entire population to compel obedience of the leader in a militaristic way. Why is there not even an active campaign by the CIA to infiltrate the Chinese mindset, unlike the CIA’s moderate Muslim movement, mosque in New York, etc. Chinese peoples and others in the region need to consider their options, for the greater herd is on the march and moving to its eventual goal – hegemony, the next and last super power on the earth. You all need to make a choice what to do when this machine marches at you, do you get out of the way, or do you try to stop it. What could have been done, what can still yet be done, or not, will be our next topic. Part 3 of our talk on China, pointing out the existential threat to America, the brainwash job on White America, and the mortal peril faced by the Japanese, Taiwanese, and Koreans in particular. The PR and propaganda job on alleged Chinese racial superiority. Our perspective on racial issues, variations, advantages, and disadvantages that matter and don’t. IQ, intelligence, consciousness, and your “awareness quotient”, intelligence, social awareness, empathic awareness and survival. Skill versus empathy and emotional awareness and resourcefulness. Blogosphere and PR on Chinese ingenuity from Western mouthpieces. Why white professors on the blogosphere are overtly talking about Chinese racial superiority. Why few Chinese people are as multi-lingual as other peoples. Mastery of the Chinese language. How the Chinese people were set-up in isolation and a job done on them, the memetic Wall. Spreading the meme through movies, 2012 and The Last Airbender, the bald Budhi boy saving a bunch of White People. Why would racist White People and Jews in Hollywood make movies about the superiority of Asian races? Why Arabs are not defined by race but language instead. Hebrew as an Arabic dialect comic exchange and Jewish cognitive dissonance as self-hating Arabs. PR campaign on exporting American jobs to China. Brainwashing of the Anglo-American and Western citizenry into a specific view of the average Chinese as harmless, wise, beneficent. Ingrained in head idea as China as land of the savior. Have you noticed this phenomenon, thought it disgusting but not had words to describe it? Making obvious what was hidden before. American Government forcefully zealously exporting jobs to America’s true number one existential threat – The reason you don’t see this, and the nature of the mind job done on you. Your emotional reactions to these words as you begin to see their truth. Deprogramming yourself to connect emotionally, memetics, emotional connection versus intellectual – and awareness. The correct and rational emotional reaction. Finally, is it really an existential threat, beyond jobs and China technological dominance. How geography, and population, affects China’s real capacity. The American betrayal of the Japanese, Taiwanese, and Koreans – and the intense need for Japanese and Taiwanese to to create a regional bloc to defend themselves, and the consequences if they fail to. Missile crisis, and the start of selling out Taiwan to mainland China. Taiwan as a bargaining chip. Again, the need for a Japan/Taiwan regional bloc of self-defence. Part 2 of our talk on China. Disclaimer 1: Asian readers, in particular Korean and Japanese, this is not directed at you, it is directed at specific memes and historical conditions that have conditioned China. In fact, if you are Korean or Japanese, or even Taiwanese – you should be very afraid, for what we see coming to pass will hit you first. It is imperative that Japan and South Korea, as well as Indonesia, Malaysia, Singapore, and other nations in the region, form a united bloc to protect your interests from the behemoth of mainland communist China. Before it is too late for you and your loved ones. Disclaimer 2: As before we make general observations – none should take offense at this. These matters concern memetics, cultural religious and ideological propensities that have real world effects on a mass scale. Where we have a somewhat irreverent tone or even angry tone at times, please keep in mind that – frankly – these matters are very grim, once you realize the ultimate implications and how it fits together, time is short, too short to mince words. Notice how the Chinese establishment’s motivation seems linked to the very same racist and elitist ideologies of eugenics and social-Darwinism that many Western conservatives support (in particular “Human Biodiversity” partisans) – these are memes that condition the mind of the one infected to accept mass murder of those he or she sees as sub-human.